Only a few years ago, the long-held dream of harnessing the strong, steady gusts off the Atlantic coast to make electricity seemed destined to remain just that. Proposals for offshore wind farms foundered on the shoals of high costs, regulatory hurdles and the fierce opposition of those who didn’t want giant industrial machinery puncturing the pristine ocean views. Now the industry is poised to take off, just as the American political landscape and energy policy itself face perhaps the greatest uncertainty in a generation. 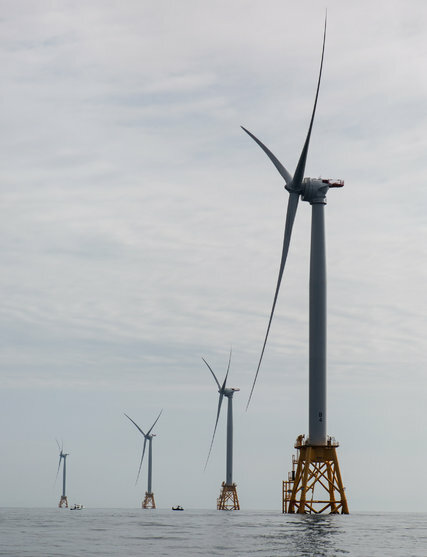 Last fall, five turbines in the waters of Rhode Island — the country’s first offshore farm — began delivering power to the grid. European energy developers like Statoil and Dong Energy are making big investments to bring projects to American waters. Last year in Massachusetts, Gov. Charlie Baker, a Republican, signed into law a mandate that is pushing development forward. And in New York, after years of stymied progress, the Long Island Power Authority has reached an agreement with Deepwater Wind, which built the Rhode Island turbine array, to drop a much larger farm — 15 turbines capable of running 50,000 average homes — into the ocean about 35 miles from Montauk. If approved by the utility board on Wednesday, the $1 billion installation could become the first of several in a 256-square-mile parcel, with room for as many as 200 turbines, that Deepwater is leasing from the federal government.